Bloodstains is the startling tale of one man’s search for the truth after inheriting the personal diaries belonging to his great-great-grandfather who he discovers was America’s first and most notorious serial killer Herman Webster Mudgett. Better known by his alias H.H. Holmes, Mudgett was the mass murderer who struck terror into the nation by being the proprietor of the infamous Murder Castle and stalking the streets of Chicago during the 1893 World’s Fair. During his incarceration awaiting execution, well over a century ago, Holmes admitted killing 27 innocent victims, but the evidence the author locates indicates hundreds more likely. From his investigation, Jeff Mudgett, the direct descendant, learns that Holmes’ reign of terror was worldwide and not limited to Chicago as has been so widely believed. Based upon never before revealed historical facts, Jeff pieces together a dynamic and extraordinary puzzle, including the strong possibility that Holmes was also Jack the Ripper. Jeff Mudgett is the author of Bloodstains, the autobiographical tale of Jeff’s discovery that his own great-great-grandfather was infamous serial killer H.H. Holmes. Bloodstains takes history even further, linking Holmes to Jack the Ripper and attempting to prove that both murderers may have been one and the same. 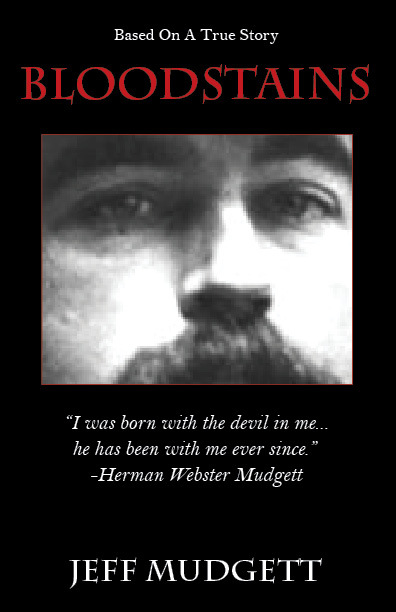 Jeff first learned that his ancestor was Herman Webster Mudgett, a.k.a. Dr. H.H. Holmes, when he was 45-years-old. As soon as this discovery was made, Jeff set out to find out more about his evil relative. Bloodstains is the culmination of that search. “The premise that author Jeff Mudgett inherited personal diaries that he discovered belonged to the serial killer while being unaware of his ancestral relationship to Holmes makes for a thoroughly captivating tale,” says Chris Allen. “Cost me a couple of sleep tossing nights,” says Bill.